Here's my latest project all done! It's a commission for Bonnie. Bonnie saw Tori's Maisonnette de Provence and fell in love with the style. And Bonnie's has purple flowering vines. It's so interesting to see them together. They started as the Adam's dollhouse kit. The doors are clear stained glass. I made them with high gloss oil based finish. I was going to do a water based polyurethane, but I grabbed the wrong one at the store. So I decide to try the oil based one. It takes more coats and it's harder to clean your brush of course. I'd stick to the water based next time! I also used silver paint as the lead. The window box is spare little pieces of wood from the kit. I decorated with a 3D hot glue design, painted and aged it. The entire exterior is covered with concrete(premixed that comes in a little tub). Some is smooth, some I carved with rocks, some is done like wood beams/trims. All the greenery is from Hobby Lobby. The roof tiles are regular pine shingles curled over the hot nozzle of the hot glue gun and then set in place on a substantial amount of plaster. Then the porch roof is done with ridged cardboard. I aged the roof and walls with wood stain. I like using darker colors like mahogany. The red in it is a great warm finish. The interior is very different from the exterior. I thought the inside should be bright and light and airy. The chandelier is just wires and crystal beads with a battery operated light. I made the fireplace mantel with leftover bits of the kit. How would you like to return home here at night? Pretty cozy! Ah Caroline, what cute lovely home! Thank you for my beautiful morning mood again! I love your houses especially it is with some French style (do not forget the French restaurant))) I'm still afraid to use different colors so boldly and freely: blue + red + yellow, but it's so good! Una casita con un encanto romántico realmente muy acogedor. Es preciosa. 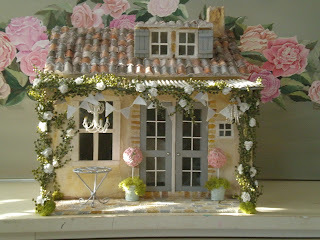 I adore that little house, sooo sweet and detailed..
Hi Caroline, what a lovely little tresure is Bonnie's maisonette !!! The picture whith the lights on is like a dream, imagine to come home in such a dream house .......... !!! Gorgeous!! I love the inside! The fireplace is amazing. The entire house is amazing. Thank you for sharing such beauty! I really love your new house. It has so much charm with all the greenery. I also like very much the curtains you put on the windows, the photos of them ofrom the exterior. And my favourite photo is the window with the closed shutters and the greenery against them. Enchanting! I love all the deatails. I love your front doors with glass and the delicate patterns it forms. I also love the windows in the roof, it's a beautiful house. The outer whit a little raw look at the interior white gives a nice effect. Absolutely beautiful inside and out, it's amazing!! I love the roof and all the climbing plants. Coming over to your blog is like stepping into another world!! Como me gustan tus casas, son todas tan bonitas. Saludos. Oh my gosh, I love your newest creation, so wonderful....those stained glass doors look amazing. Your are so clever with all the things you come up with and how you make them. Love the stone work too and the vines that look like wisteria vines........just so charming. So heard anything about the house?? Is it in Florida perhaps?? Take care sweetie, and have a lovely weekend. Es una casa preciosa,con ese encanto y dulzura que tu sabes poner en cada detalle!!!! Precioso,tu casas tienen un encanto especial. No conocia tu blog y he quedado encantada . Tus casa son una maravilla . No sabria que me gusta mas de tu casita......si TODAAA, es una verdadera preciosidad. Cada detalle en su sitio y puesto con excelente gusto. Me encanta el aire que le has dado y toda esa fantastica vegetacion que la adorna. Bellissima casa di bambola ..un sogno!! Molto dolce e romantica!! Le foto sono cartoline ..complimenti!!! Sono una tua nuova amica!! Ti seguo con ammirazione!! So remarkably sweet and charming! To answer your question, it would be so lovely to have such a sweet place to return to at night.